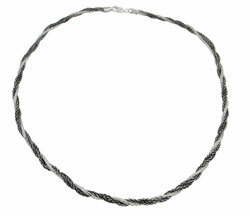 This is an Italian braided three stand sterling silver foxtail chain necklace. 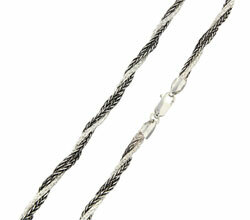 Two of the foxtail chains are a blackened sterling silver and one is a traditional sterling silver. Italian jewelry manufacturers are well-renowned for their exquisite design and fine craftsmanship. The shiny foxtail chain links glisten when light hits them. The solid sterling silver chain is stamped 925 and Italy so you can be assured of the style, quality and craftsmanship. This comes with a sturdy lobster claw clasp for security and ease of use. It is available in 16, 18, 20 and 22 inch lengths. Check out the matching bracelet for a smart, coordinated fashion statement.